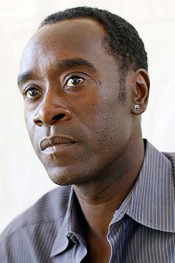 In The Guard, as FBI agent Wendell Everett, Don Cheadle is sent to Ireland to investigate an international drug smuggling ring. There, he meets the take-no-prisoners cop Gerry Boyle, played by Brendan Gleeson. The clashing pair soon realize, of course, that they’ll need each other to crack the case, and eventually form the most unlikely cop combo since Chris Tucker and Jackie Chan. The Guard doesn’t reach Rush Hour-levels of infamy, but its charms are abundant, not the least of which is watching Cheadle navigate the Emerald Isle. Here, the actor talks about his fish-out-of-water experience. You’re an actor as well as an executive producer on this film. How did you get involved? It came to my attention via my team. It was a script that they really responded to, and thought it was really funny and different. I read it and had the same reaction. We met with the director John Michael McDonagh and he gave us his ideas for the vision of the film and who he wanted in it. I found out that Brendan was going to be a part of it, and that was just it for me. Shooting on location in the area that it’s based in, and with this cast, it was a no-brainer. I said yes immediately. This is McDonagh’s first feature as a director. What do you like about working with first time directors? Very often their best film is their first one, because it’s something that they have lived with for a long time. They are passionate about it and thorough with their point of view. Sometimes they don’t want to change a word and they’re not open and maleable, but that wasn’t the case with John. He was very open to our interpretations of the material. Although, ultimately, 99.9% of what we did was on the page. There was not a lot of improv or ad-libbing. This movie has a lot of style. Was that on the page or did that take form later during the performances and in the editing? It was on the page, but it was enhanced by all of the ancillary things like music, editing and the pacing of it. However, I felt that same pace when I read it. When you get real people saying those lines, it surpassed what the experience was just reading it. It kept its humor and pop. Tell me about filming in Ireland and it’s importance in the movie. I think Connemara and Galway is another character in the movie. Shooting against that landscape with those people in those areas, you couldn’t have bought that. It really laid the framework for where we were and what my character had to deal with. How did the locals take to you guys shooting in those areas of Ireland? Every night we went to the pub, had Guinness and hung out. Everybody was really great and open and welcomed us.